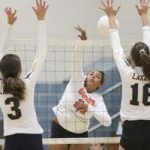 The Standard Examiner released it’s Volleyball All-Area Teams, and Ogden Senior Makin Clarke was named Honorable Mention. Click here to see the list of the members of the All-Area Honorable Mention Team. Girls Varsity Volleyball · Sep 29 Volleyball falls to Juan Diego 3-0. Girls Varsity Volleyball · Sep 29 Volleyball falls to Tooele 3-0. Girls Varsity Volleyball · Sep 23 Volleyball falls to Stansbury 3-0. Girls Varsity Volleyball · Sep 23 Volleyball loses on the road to Park City, 3-0.